New report shows startling new trends in the haredi community. Poverty and fertility rate dropping, more haredim getting university degrees. A new report by the Israeli Democracy Institute shows that the Israeli haredi community is undergoing significant changes, with an increasing number studying in institutions of higher education and a decline in fertility rates. 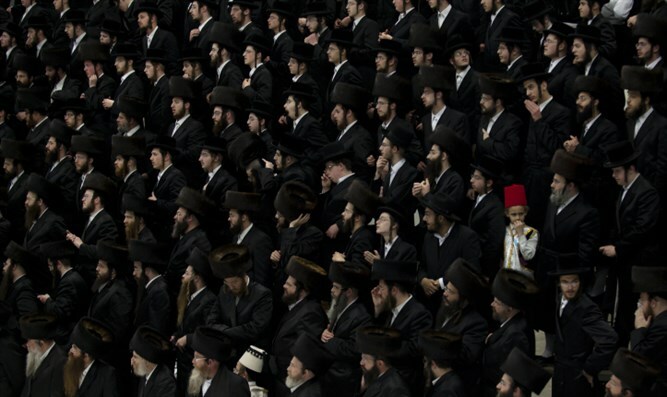 According to the report, the number of haredim in Israel reached one million in 2017, over 12% of the population in Israel. By 2030, the haredi community is expected to constitute 16% of the total population, and by 2065 one third of the Israeli population (40% of the Jewish population of Israel). The haredi demographic also tends to be young - 58% of haredim are 19 or younger, compared to 30% of the general Jewish population. However, since 2005 there has been a decline in the fertility rates of haredi women - the average number of children per haredi woman dropped to 6.9, from its high of 7.5 in 2003. The rate of married women amongst the adult haredi population over the age of 20 stands at 82%, compared with 63% among the rest of the Jewish population. The report stressed that the average marital age among haredim is rising - while in 2005, 61% percent of haredim aged 20-24 were married, only 44% of haredim in that same age group are married in 2017. The report found similar trends across all age groups. While in 2005, 76% of haredim between the ages of 20-29 were married, only 67.5% were married in 2016. Accordingly, the proportion of married women aged 20-29 in 2005 was 80%, while in 2016 there was a decline to 67%. Men also experienced a moderate decline in those years, from 71% to 68%. The number of haredim studying in higher education has skyrocketed over the past decade, rising from 1,000 to 10,800. The report contends that haredim are increasingly pushing off marriage in order to focus on academic studies and their professional future in what observers call a sea change in the historically marriage-centered community. "It used to be that a young haredi person didn’t have the option of [secular] higher education, so the path was clear – marrying young," Israel Democracy Institute researcher Dr. Gilad Malach told Haaretz. "Today, when there are many possibilities, a fair number choose to earn a degree, find a good job and marry after that has been accomplished." When interviewed on the radio, he added that marriage is viewed the same way it has always been: the goal is to raise a family and there is no physical contact before marriage. These numbers could have an effect in tempering tto some extent he rapid growth the haredi community has been experiencing. The haredi community makes up 12% of Israel's population, and a 2016 report found that Israel’s haredi population is likely to surge past the country’s Arab population by mid-century – and become the single largest religious group among Israeli Jews. While there has not yet been a drop off in the haredi fertility rate, experts say that, in general, women who marry later are likely to have fewer children. This does not necessarily translate to haredi women, but "if a woman marries at 20 and has an average of seven children, she completes her childbearing in her mid-30s, and at 40 she is already marrying off the next generation. But if she marries at 27, she finishes giving birth only at 40 and is in her mid-50s when she starts marrying off her children," said report co-author Maya Choshen.